Most of you have already seen footage of the disaster the F-4 tornado caused recently in towns like Rochelle, IL. Since the storm, there has been an overwhelming donation of food, water, blankets, and clothing. What residents need now as much as anything is financial assistance. 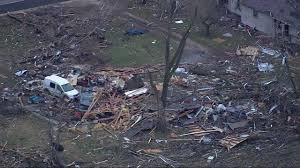 Numerous clubs throughout Illinois will be collecting monetary donations and gift cards to retailers such as Bed, Bath, and Beyond and Home Depot. Our club will be involved in this undertaking as well and will bring any collected money and gift cards to the District Conference next week. Please let others know about our efforts. Consider friends and family, coworkers, social media, etc to spread the word. I will personally make some time next week before leaving for conference to pick up any contributions if you can't get them to me yourselves.